What We're Doing This Weekend: October 21-23 | Nerd Much? If you’re like us, you’re frequently overwhelmed by the sheer number of nerdy things to do every week. Between new episodes of TV shows airing, older series to catch up on, and new video game releases every week, it can be tough to pick what to do right now and what to save for later (by later, I mean when things slow down a bit). We figured that if we talked about what we’re doing this weekend, maybe it’ll help you make up your own minds as well. 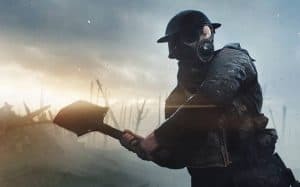 But we’re right in the heat of things here in the middle of October, with this week seeing the release of some of the year’s most anticipated games, including Battlefield 1 and Civilization 6, and the return of The Walking Dead. I’ve already spent some time with Battlefield 1, and I’m loving every minute of it so far. There are some absolutely huge maps, and I can’t wait to jump into more over the weekend. With Civilization 6 also dropping today, I’m planning to jump into that at some point if I can pull myself away from Battlefield 1. And of course, there are those games that I keep in frequent rotation that will get some playtime this weekend, including Overwatch (I’m trying to get that Hanzo Halloween skin!) and World of Warcraft, in which I’ll likely jump straight into the Hallow’s End content for some Headless Horseman goodies and yearly Trick-or-Treating. What’s more, Battlerite will introduce some of its Halloween-themed cosmetics, so I’ll probably play some of that to see if I can pick up some snazzy skins. Admittedly, I love holiday content — especially Halloween — so any game that contains limited time Halloween content always gets priority over the other stuff. As far as the TV world is concerned, this Sunday will see the return of The Walking Dead, in which we’ll finally find out who Negan killed in the Season 6 finale. Of course, we already “know” who he kills, thanks to the powers of deduction, reasoning, and the internet researchers, but officially speaking, we’ll find out on Sunday. Also on Sunday, we’ll have the fourth episode of Westworld, which if you’re not watching, you should take the weekend to catch up on; it’s a great show that we think our readers are going to like. It’s a show that gets us thinking about the ethical issues of sentient robots, and we love to do that. What are YOU doing this weekend? Sound off below in the comments — we’d love to hear from our readers.